Black Male College Explorers Program directors from Edward Waters College (EWC), Bethune-Cookman University (BCU), Florida A&M University (FAMU) and Florida Memorial University (FMU), along with the 137 program participants at the Ebenezer Baptist Church in Atlanta, Ga. The number of explorers participating in this motivational field trip is as follows: FAMU (42), EWC (37), BCU (32) and FMU (26). TALLAHASSEE, FL – The Florida A&M University (FAMU) Black Male College Explorers Program will host its end of the year banquet on July 18. 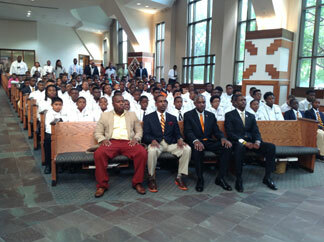 More than 50 young African-American males participated in the FAMU Black Male College Explorers Program this summer. This program provided six weeks of highly concentrated developmental experiences, which includes weekly seminars, workshops and motivational trips. FAMU alumnus Edward G. Tolliver, who is the director of FAMU’s Black Male College Explorers Program, expressed his thoughts about the program. The objective of the Black Male College Explorers Program is designed as an at-risk prevention/intervention program specifically to prevent Black males from dropping out of high school; facilitate their admission to college; and significantly increase their chances of earning a college of degree. Middle and high schools from Tallahassee and major cities all over Florida are participating in the program. Participating schools are asked to identify at-risk males enrolled in grades 7 through 11. One of the highlights from this summer’s program was a trip to Washington DC, where the youth had the opportunity to participate in a symposium on Black males at the National Press Club. The group also traveled to Atlanta, Ga. for a three-day motivational field trip, which included stops at the Georgia Aquarium, Martin Luther King, Jr. National Historic Site, Six Flags White Water Park and church service at Ebenezer Baptist Church. During the service, the137 participants from the FAMU, Bethune-Cookman University, Florida Memorial University, and Edward Waters College Black Male College Explorers Programs were all in attendance. For more information on the Black Explorers Male Program, contact Edward Tolliver at (850) 561-2407.